From My Brown Eyed View : Rachel Jeantel's Respectability as a woman should not be on trial! Rachel Jeantel's Respectability as a woman should not be on trial! I have only watched one moment in the Zimmerman trial. 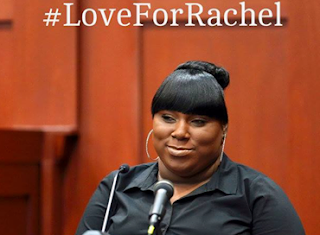 That moment was during the first round of testimony given by Rachel Jeantel, Trayvon Martin's friend. As I watched and listened to Rachel give her account of what occurred while she was talking to Trayvon, a sense of uneasiness filled my thoughts. That sense of discomfort did not come Rachel's appearance or her speech. I was sensing a familiar historical event about to unleash itself into the life of this young woman that would place her in a position to become a target for the public at large to take aim at with ideas of female respectability and she was going to be caught in the crossfire of Black and White Americans. I knew that there was going to be a segment of the African American community that was going to fire on this young woman because she does not fit their ideas or imagery of a respectable Black female image. The comments on social media that I read yesterday confirmed my worst fears. Comments about her were centered on her appearance, her speech, the lack of a "formal education" etc..etc. By the time the Tweet by Lolo Jones came through my Facebook news feed, I was ready to find her and slap her face because it was obvious that she was using a familiar colorist mannerism by comparing Rachel to Tyler Perry's M'dear character. Did people forget that this same young woman is being required to go back into a moment in her life where her friend--Trayvon was being stalked by Zimmerman while they were talking on the phone? Rachel was the person on the phone with him before the physical encounter occurred. They had a relationship as friends that did not include the rest of the African American population. We honestly do not know this young woman on an intimate level. No real consideration was given to the fact that she is from a Haitian background and speaks a mixture of languages from that culture. A lot of remarks were made about her lack of formal education and not being able to read cursive writing. I wonder if people realize that right here in America, there are school districts that no longer teach children to write or read in cursive because the administrators believe that children cannot learn to master both skills during their school day. We do not have the luxury of picking the individuals who will represent our race in the prefered manner. This is a reality that seems to elude a lot of people. We are the ones who demanded that the family of Trayvon Martin have justice in his murder. We hooded up, took the streets, signed petitions and made an effort to keep stories about his death circulating within social media sites, the media and also in our neighborhood. Now that we have reached the point where the trial is a reality, can we really afford to attack this young woman with notions of respectability and proper representation according to a standard that many of us could not meet. I believe that Rachel deserves our support and our understanding. We helped to propel her into the national spotlight with the demand for justice for her friend Trayvon. If we attack Rachel Jeantel for not being the woman that makes us feel comfortable then we are also acting in an unjust manner. She is not the one who is on trial for the shooting death of Trayvon Martin. George Zimmerman is the one on trial for taking his life. We cannot lose perspective about the true reason for this trial and who is actually being tried. Rachel Jeantel deserves our respect and our support. Anything less than that is not acceptable at this particular moment. The Shaming of Rachel Jeantel!!! !